In this blog post you will learn how to know when to use each word for “time” whether it is talking about time in general, the time of the day or a time as in an occasion. Tiempo – Time or Weather? 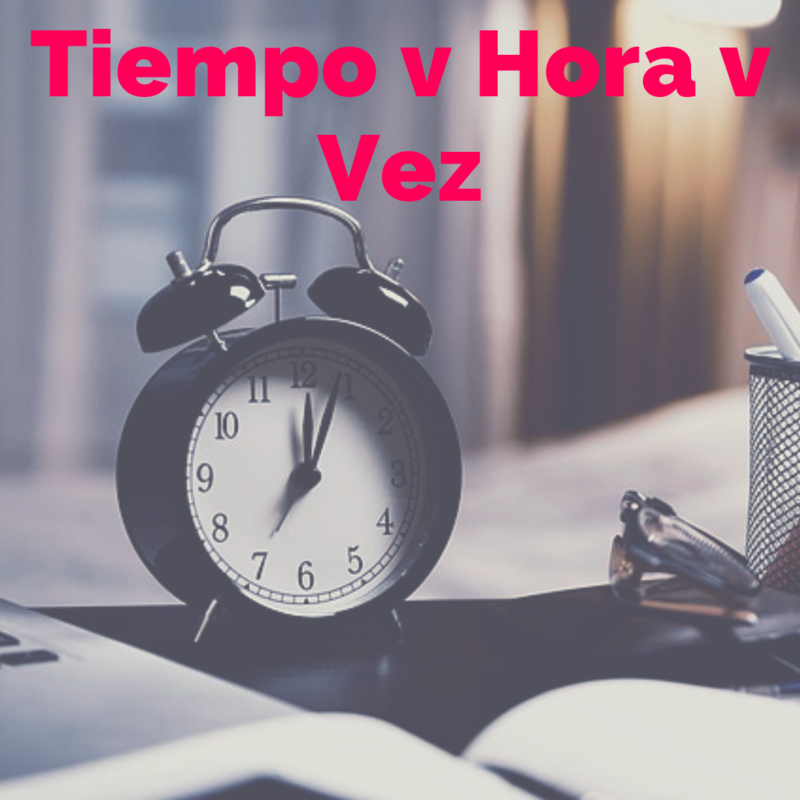 When you hear or see the word “tiempo” used, it can be confusing as to whether it means “time” or “weather”. The tip is to look at the rest of the sentence. If the verb “hacer” has been used, it probably is being used as “weather”. e.g. Hace buen tiempo – It is good weather. e.g. Hizo mal tiempo ayer – It was bad weather yesterday. No tengo suficiente tiempo. – I don’t have enough time. Hace mucho tiempo que no nos vemos. – It’s been a long time since we’ve seen each other. You can use “tiempo” as part of the phrase “a tiempo” which means “on time”. Siempre llega a tiempo. – He always arrives on time. You can use “tiempo” to talk about an era or a period of time in history. Often you use the word in the plural. Eran tiempos difíciles para los españoles. – They were difficult times for Spanish people. The word “hora” is used to describe the clock time. ¿A qué hora vienen? – What time are they coming? The best way to think of this word is to see it as an “occasion”. ¿Cuándo es la última vez que fuiste a España? – When is the last time you went to Spain? Vamos a la playa muchas veces durante el verano – We go to the beach many times in summer. Me gustó el argumento de la película pero al mismo tiempo no me gustó el fin de la película. I liked the film plot but at the same time I didn’t like the ending of the film. Siempre hablan al mismo tiempo así que no puedo entenderlos. They always talk at the same time so I cannot understand them. María trabaja como secretaria a tiempo parcial. Maria works as a secretary part-time. Mi amigo trabaja a tiempo completo.